The Red Hot Organization has released over fifteen compilation albums since 1989, as part of its dedication to fighting AIDS through pop culture. I was able to thank founder John Carlin firsthand during an interview for this ingenious method of supporting a worthy mission, one that continues to haunt those of us who watched friends with the disease given a death sentence during the 80s and 90s. The latest album will pay tribute to Arthur Russell, part of the music scene in NYC's East Village during that time until his untimely death at age 40 in 1992 from AIDS-related causes. He was a talented cellist, pianist, and singer, who easily shifted from classical to folk and disco when composing. 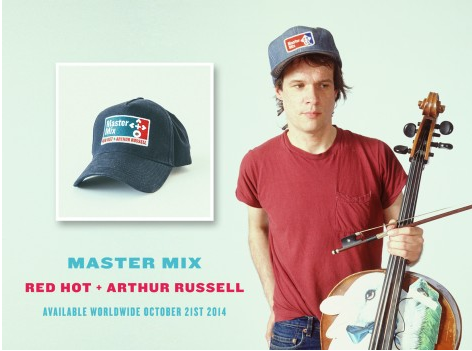 Red Hot + Arthur Russell (due October 21 via Yep Roc) features 26 tracks by more than 20 artists. It includes many faves from my New Music Playlists: Hot Chip, Sufjan Stevens, Phosphorescent, Junip's José González, Devendra Banhart, Arcade Fire's Richard Reed Parry and Neon Indian's Alan Palomo (as VEGA INTL). Hot Chip is a perfect fit for one of Russell's dance tunes, as witnessed in a preview video showing some behind the scenes recording of "Go Bang." Check it out along with the track list below, and add this album to your list for fall listening.